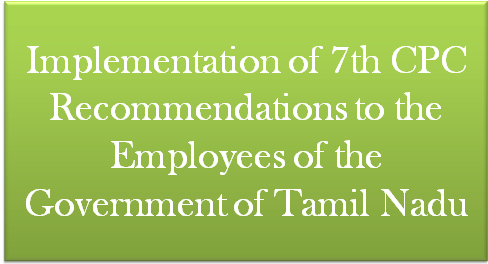 OFFICIAL COMMITTEE - Constitution of an Official Committee to examine the revision of Pay scales / Pension to the State Government employees and pensioners following the decisions of the Central Government on the recommendations of the Seventh Central Pay Commission –Ordered. 2. (i) The Committee shall be chaired by seniormost Member. 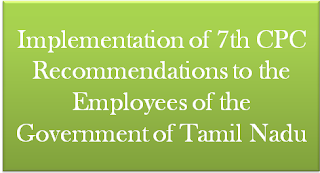 (ii) The Committee shall examine the orders issued / to be issued by the Central Government on the recommendations of the Seventh Central Pay Commission scales of pay and make necessary recommendations regarding revision of the pay scales to the State Government Employees and Teachers including employees of Local Bodies. (iv) The Committee shall also examine the decision of the Government of India on the revision of pension, family pension, retirement benefits etc., and also make necessary recommendations to the State Government pensioners. constituted for this purpose by Government of India. 3. The Committee shall submit its report to Government within four months i.e. on or before 30-06-2017. 4. Orders regarding supporting staff to the Official Committee will be issued separately. 5. All the Departments of Secretariat and Heads of Departments are requested to render all necessary information to the Committee as and when sought for. 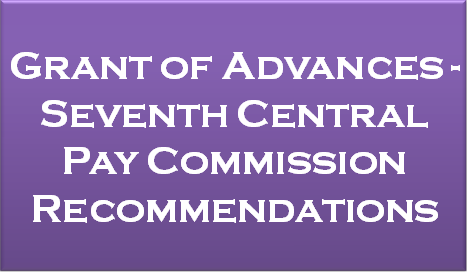 Subject: Grant of Advances - Seventh Central Pay Commission recommendations-Amendment to rules on Computer Advance to Railway servants. Consequent upon the decision taken by the Government on the recommendations of Seventh Central Pay Commission, the Ministry of Finance vide their OM No. 12(1)/E.II(A)/2016 dated 07.10.2016 have amended the eligibility criteria in the existing provisions relating to the grant of Personal Computer Advance. 3. Further, Ministry of Finance in their ibid OM have also decided that the other interest bearing advances relating to Motor Car Advance and Motorcycle/Scooter/Moped Advance will stand discontinued. 4. The above mentioned OM of Ministry of Finance relating to grant of interest bearing advances will apply mutatis-mutandis to Railway employees also. 4.1 So far as the interest free advances are concerned, Bicycle and Warm clothing advances stands abolished for Railway employees also in terms of MoF’s decision. 4.2 Orders relating to other interest free advances will be issued separately by concerned Directorates. 5. Necessary Advance Correction Slip to the chapter XI of the Indian Railway Establishment Manual, Vol.I Revised Edition, 1989 will follow. 6. The revised orders are effective from 07.10.2016 i.e. the date of the issue of the aforesaid OM of the Ministry of Finance. Past cases where the advances have already been sanctioned under the provisions of earlier rules on the subject need not be reopened. (d)if so, the details thereof and if not, the reasons therefor? (a) & (b): Yes, Madam. 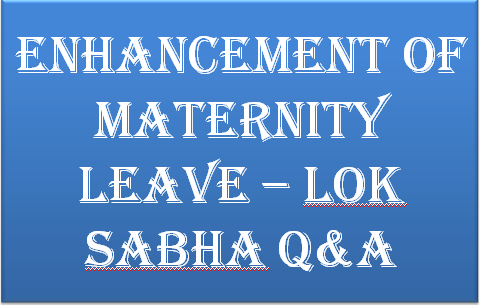 The Government has decided to enhance the paid maternity leave from existing 12 weeks to 26 weeks and an Amendment Bill in this regard was introduced in the Rajya Sabha. The Rajya Sabha has already passed the Bill on 11.08.2016. With regard to women workers covered under Employees’ State Insurance Act, 1948, such enhancement has already been effected by amending the ESI (Central) Rules,1950. (c) & (d): There is no proposal to amend Section 4 of the Maternity Benefit Act, 1961. The benefits under this Act are already applicable and available to women employed in various public sector undertakings. 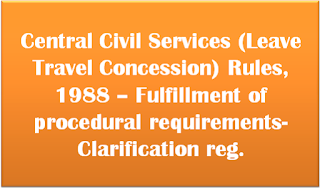 Central Civil Services (Leave Travel Concession) Rules, 1988 – Fulfillment of procedural requirements- Clarification reg. 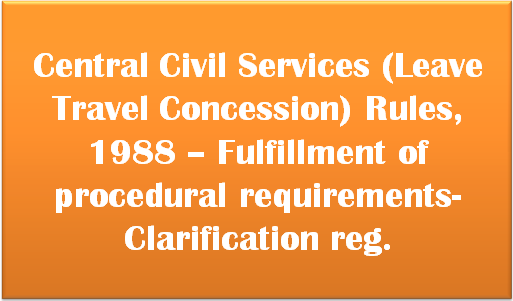 Subject:- Central Civil Services (Leave Travel Concession) Rules, 1988 – Fulfillment of procedural requirements- Clarification reg. (a) In all such cases the Government servant may be required to submit a declaration that he and the members of the family in respect of whom the claim is submitted have indeed travelled upto the declared place of visit. (b) If a public transport is available in a particular area, the Government servant will be reimbursed the fare admissible for journey by otherwise entitled mode of public transport from the nearest airport/railway station/bus terminal to the declared place of visit by shortest direct route. (c) In case, there is no public transport available in a particular stretch of journey, the Government servant may be reimbursed as per his entitlement for journey on transfer for a maximum limit of 100 Kms covered by the private/personal transport based on a self-certification from the Government servant. Beyond this, the expenditure shall be borne by the Government servant. (d) Furnishing of false information will attract disciplinary action under the CCS(CCA) Rules, 1965. Note: For the purpose of these rules, the expression ‘Public Transport” means all vehicles, including trains and airplanes operated by the Tourism Development Corporations in the Public Sector, State Transport Corporations and Transport services run by other Government or local bodies. Sub: Revision of rates of stipend to apprentices and trainees on Railways. Consequent upon the promulgation of Railway Services (Revised Pay) Rules, 2016 on the basis of the recommendations of the Seventh Central Pay Commission, the issue of revision in the rates of stipend to apprentices and trainees (non-gazetted) on Railways was under consideration. Now, the President is pleased to revise the rates of stipend to the apprentices and trainees as per the schedule attached herein. 2. It is likely that some of the existing categories of apprentices on certain Railways may not have designations identical to what appears in the enclosed Schedule. In such cases, the Railway administration, in consultation with FA & CAO, should identify the designation/category of the apprentice concerned with similar case appearing in the Schedule and determine the rate of stipend applicable thereto. Wherever such identification is not possible, specific cases may be reported to the Board with verbatim comments of the FA & CAO. 3. In case, the period of training as indicated in these orders is at variance with the actual practice in respect of one or more categories, the matter should be referred to the Railway Board for decision. 4. The apprentices and trainees will draw the revised rates of Dearness Allowance appropriate to the revised rates of stipend. 5. The revised rates of stipend will take effect from 01.08.2016. 6. This issues with the concurrence of the Finance Directorate of the Ministry of Railways. 7. Hindi version is enclosed. The All-India CPI-IW for December, 2016 by 2 points and stood 275 (two hundred and seventy five). On 1-month percentage change, it decreased by (-) 0.72 per cent November and December, 2016 when compared with the decease of (-) 0.37 per cent between the same two months a year ago. The maximum downward pressure to the change in current index came from Food group conuibuting (-) 2.74 percentage points to the total change. At item level, Arhar Dal, Gram Dal, Masur Dal, Urd Dal, Groundnut Oil, Muslard Oil, Chillies Green, Ginzer, Brinjal, Cabbage, Carrot, Cauliflower, French Beans, Gourd, Green Coriander Leaves, Methi, Palak, Peas, Potato, Radish, Tomato, Banana, Lemon, etc. are responsible for the decrease in index. However, this decrease checked by Rice, Wheal, Wheat Alta, Coconut OiL Fish Fresh, Goat Meat, Milk Snack Saltish, Cooking Gas, ESI Premium Contribution, Petrol, Flowe/Flower Garlands, Toilet Soap, etc., putting upward on the index. The year-on-year inflation measured by monthly CPI-IW stood at 2.23 per cent for December, 2016 as compared to 2.59 per cent for the pervious month and 6.32 per cent during the corresponding month of the previous year. Similarly, the Food inflation stood at 0.67 per cent against 1.66 per cent of the previous month and 7.94 per cent during the corresponding month or the previous year. At centre level, Rourkela reported the maximum decrease or 10 points followed by Vadodara (9 points), Nagpur and Lucknow (8 points each) and Amritsar, Varanasi and Monger Jamalpur (6 points each). Among others, 5 points decrease was observed in 7 centres, 4 points in 12 centres, 3 points in 9 centres, 2 points in 15 centres and 1 point in 10 centres. On the contrary, Quilon recorded maximum increase of 6 points followed by Ernakulam and Mundakkayam (3 points each). Among others, 2 points increase was observed in 4 centres and 1 point in 4 centres. Rest or the 7 centres indices remained stationary.